Kids Headphones, EasySMX On-Ear Headset Wired Foldable 85dB Volume Limited with Mic Headphone Splitter 3.5mm Jack In-line Control Children Headphones (Pink) by EasySMX at B Bluetooth. MPN: KM-669-Pink-US. Hurry! Limited time offer. Offer valid only while supplies last. 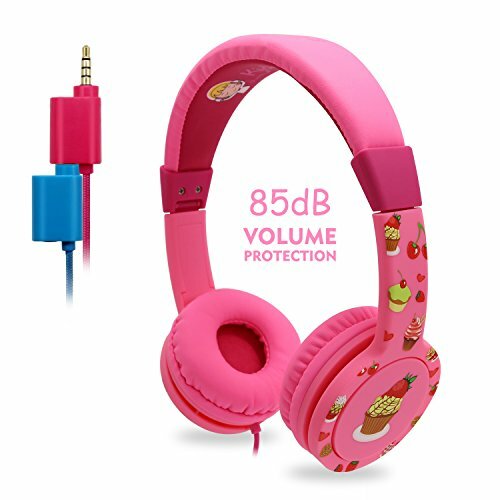 Product Features EasySMX Safe Kids Headphones are designed for children ages 3 and up, 85dB volume limited with headphone splitter for sharing. EasySMX Safe Kids Headphones are designed for children ages 3 and up, 85dB volume limited with headphone splitter for sharing. Foldable, lightweight and comfortable design makes it a must for car rides, plane trips, hanging out or at home.